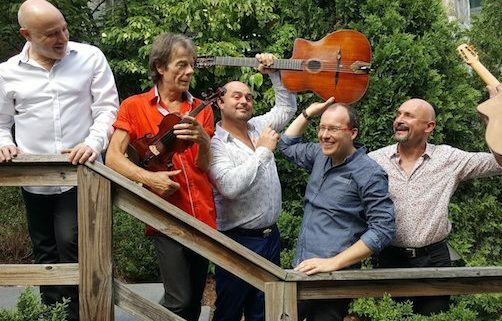 Today, the refined embodiment of gypsy jazz with a personal touch – not just Schmitt’s but each of his band mate’s – is the Django Festival All-Stars. That said, playing music in the Django tradition is not something just anyone can do. According to the accordionist, this is why gypsy jazz is so popular not only in France but throughout the world, among people of all ages who love every genre of music. But the genre wasn’t so popular when he first discovered it in the 1980s, when new music was largely electronic-based pop. “But in the late ‘90s the appeal for world music revealed the Django legacy to the public and became popular among all kinds of people from young heavy-metal fans to white-collars businessmen,” Beier says, adding that in France today, Gypsy jazz is one of “the strongest” forms of music. Beier began playing with Schmitt when the guitarist was still performing with his father and the two bonded immediately when it was clear that they both relished what Beier calls “the new side of Django’s music.” They have been playing together as the Django Festival All-Stars for 16 years. The quintet returns to Vail with a pair of intimate performances at The Sonnenalp’s Ludwig’s Terrace on Wednesday, July 18. Doors for the first seating open at 5 p.m. with performance beginning at 5:30. Doors for the second seating are at 7:30 p.m. with music starting at 8 p.m. Tickets at $40 or $136 for a subscription to the remaining Club Series performances through Aug. 8. Full dinner service is available, not included in ticket cost and a $30 per person food or beverage minimum applies. Get tickets here. The All-Stars deliver a fiery big stage performance in the Jazz Tent at Lionshead’s Vail Square at 6 p.m. on Thursday, July 19. Tickets are $25 for general admission, $40 for preferred seat and $50 for premium seat. Subscriptions are also available for multiple performances. Beer, wine and cocktails are available for purchase. Also, don’t miss the after party with local pianist Kathy Morrow at the Vail Chophouse from 8 to 10 p.m. Get tickets here.